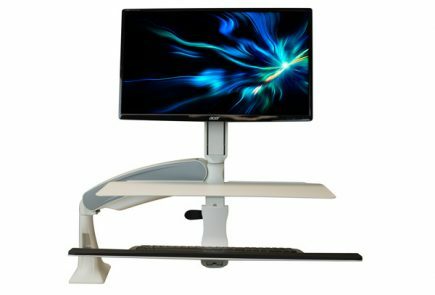 The newest ZipLift model introduces the same ergonomically-adjustable keyboard tray, a similar silky-smooth Z-lift mechanism, and three grommet holes for infinite monitor arm options. Rock-steady at the full 20"+ height extension. Additional charges for AK, HI, Canada, and international (DHL). Your ZipLift+ HD ships within 3-5 days of order. Add up to 5 business days for freight delivery anywhere in the continental US. Workspace: 42" W x 15.7" D. Keyboard platform: 26.4" W x 13" D. Grommet hole diameter: 2"
The Ziplift HD is everything we loved about the Ziplift+ and then some. A bigger work surface, higher lift capacity and a third grommet hole make this a nice upgrade for those with the space. It features the same smooth gas-strut lift mechanism with infinite height adjustment, as well as a tilting keyboard tray, so finding your optimal ergonomic position is a breeze. It’s no secret that we loved the iMovR Ziplift. The Ziplift+ HD is iMovR’s upgraded version, with all of the features we loved about the original, plus a larger 42” work surface and an upgraded weight capacity. The HD, or heavy duty, offers a superior 45 lb lift capacity for those who wish to use two 27” monitors and their laptop at once. Thanks to the generous amount of surface space, there is room for your documents and coffee as well. A third grommet hole opens up additional mounting options so you can customize your work surface just the way you like. It carries over several winning features of the original Ziplift. 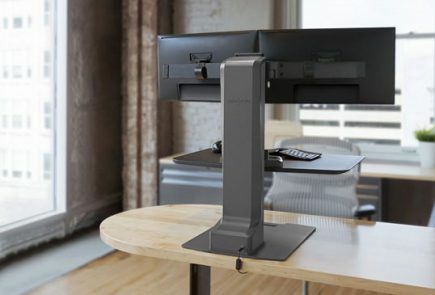 The same 20” height range accommodates users from 5’0 all the way up to 6’7”. 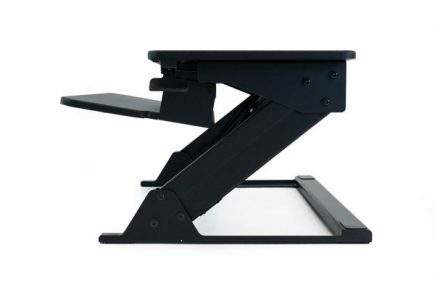 It also preserves its predecessor’s ergonomically adjustable keyboard tray with up to -15° tilt, saving your wrists from strain and beating out competitors like Varidesk. The silent lift mechanism allows for infinite stops at any point up to to max height, with silky-smooth adjustment made possible by a gas-strut lift system. We’d caution users to remember, though, that the counterbalance is only 15 lbs, so while the HD supports much more weight than that, it will become increasingly difficult to lift as you pass the 15 lbs threshold. Like the original, the Ziplift+ HD is backed by a 5-year warranty and a generous 100 day return window. There’s no assembly required, meaning that unlike cheap competitors, you don’t have to worry about a confusing assembly and the instability that could potentially result from a mistake. To sum it up, the Ziplift+ HD is a larger version of the Ziplift with a higher weight capacity. It doesn’t reinvent the wheel, but it brings the same suite executive suite of features to a larger scale. For that reason, the HD is a great choice for anyone with the room to accommodate it, at home or at the office. Please read about our review process in the Anatomy of a Review. 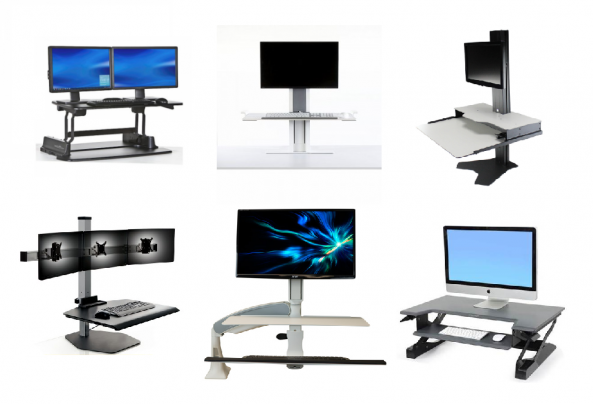 And compare the ZipLift+ HD to its competitors in more detail with our comprehensive Standing Desk Converters Comparison Review. Top Work Surface: 42" W X 15.7" D X .5" H; maximum weight capacity 45 lbs. Keyboard Tray: 26.4" W X 13" D X .5" H; maximum weight capacity 5 lbs. Work Surface Height Adjustment: 20 5/8"
The iMovR ZipLift+HD is backed by a 5-year warranty. The iMovR ZipLift+HD ships for free in the contiguous 48 states. Delivery in 3 to 5 business days. Contact iMovR for shipping charges to other destinations.